Do you like the taste of dry food? Are you aware that dried foods are much healthier and mineral rich than hydrated food? The best thing is, you can dry it yourself! If you want to find out everything about food dehydration, read on, and you will be amazed by how easy and healthy it is. In the last several years, food dehydration became very popular. Instead of freezing food, people opt to dehydrate it to get more nutrients. Food dehydration removes water from both plants and meat, giving them a different taste and a ton of new cooking opportunities in the kitchen. Not only does the food get a new taste, but it also gets a completely new texture, and structure, not to mention the numerous health benefits. But why is dehydrated food so good? Well, it’s usually food that people grow themselves, and they also prepare it as well. It’s an inexpensive way of preserving healthy food for your family, and it also gives you the satisfaction of being self-sufficient. There are tons of ways you could dry and preserve your food. Each of them has benefits and downsides, and you can even combine more techniques to create something really special. Preparation is the hardest part of drying foods because you need to cut the fruit, blanch vegetables, take the parts you don’t need off, but when you put everything in the dryer, all you need to do is wait. 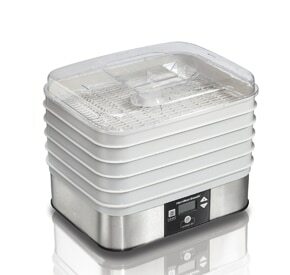 The dehydrator will do all the work, and once it’s done, you’ll just have to pack it. When you want to dehydrate your food, you’ll need to make a payment only once. When you buy the equipment you need, you can use it to dry tons of food for free. The costs go down even further if you grow it in the garden. Once your food is all dried up, you can store it well in airtight containers like jars, or Ziploc freezer bags. Most dehydrated food lasts from six months to a year, but they will last even longer if you put it in the freezer. When you dehydrate your food, it loses water and takes up only a fraction of its original size. This is the perfect way of food preserving if you don’t have lots of storage space. Cocking dehydrated food is really easy, and you can eat most dried food as snacks. If you want to cook them, just toss them in the frying pan with some water, and they will reconstitute once again, much like carrots and potatoes do in a soup. You will need to soak some foods in water before cooking them. When you remove water from food, it loses weight and becomes a dried “superfood” that has more flavor and nutrients than fresh food. You will lose some nutrients upon preservation, or if you decide to cook them. When you dehydrate food, it loses some of its vitamins A and C, and veggies lose the most nutrients because of the blanching process. Some experts claim that dried food is healthier than canned or frozen food because the vitamins and minerals are in higher concentration. You can actually eat less and get more nutrients this way. Dried herbs and fruit are healthy, and they are a perfect snack. You can use dried foods in many different ways. There are tons of recipes you can use to create awesome dried snacks that will keep you healthy for a long time to come. The process of food dehydration is in other words, food drying. During this process, the food loses moisture through evaporation. When the moisture is gone, so are the microorganisms that spoil food over time. When you storage dried foods, the bacteria and microorganisms can’t grow so you can preserve it for a long time. Food dehydration is really a simple process that anyone can do. All you need is some warm air that pulls the moisture out of the food. People that live in sunny parts of the world dry their foods in the sun for centuries. The problem with this type of dehydration is that it doesn’t take all of the moisture out, so the food can’t be preserved for a long time. That’s why today, people that dry food use dehydrators. They are specialized machines that dry your food perfectly. Below, you can read every step of the food drying process. When you want to dry your food, these are the principles you have to stick by to get the best results. 1. Use only the best vegetables and fruit. Just like freezing and canning, dehydrated foods have to be fresh and of good quality. Choose the fruit that’s ripe, and without bruises. 2. Cut the fruit to the desired shape for serving. For example, you can cut apples into slices or rings before the drying process. 3. Cut the pieces to the same size and the same thickness to dry them evenly. Slices that are between 1/8 and 1/4 inches will dry quicker than thicker slices. 4. Some foods need to be washed before the drying process. Foods like berries, herbs, and seedless grapes all need washing before you dehydrate them. 5. Do this to prevent browning: you can steam or coat light-colored fruit with lemon juice. The acids will protect the coloring. Some vegetables need to be blanched to dry well. 1. Figure out the drying method you will use and get the equipment you need. You can dry your food in an oven, the sun, or a dehydrator. The time needed for the food to dry depends on the method used. 2. Maintain a temperature of about 140F and make sure that the air circulates. You have to remove moisture as quickly as you can to prevent the food from spoiling. The temperature needs to be about 140F for the moisture to evaporate without affecting the color, texture, nutritive value, or the flavor of the food. If you don’t have enough heat and air circulation, the food can be affected by various bacteria and microorganisms that will make them unfit for consumption. If you have too much heat and not enough humidity, you could lose all the nutrients. Either that or the food’s outer surface becomes too hard which prevents the moisture to evaporate. 3. Knowing when the food is dry. When the food becomes leathery, or brittle, you know that it’s dry. Vegetables are drier than fruit and you don’t need to condition them at all. 1. Give the dried fruit enough time to condition (important). When you dry your fruit, you will have to wait for another four to ten days for it to condition and get ready for packaging. The moisture of the food you dried fruit is about 20%. The reason why you have to leave the fruit to condition is because you have to wait for the remaining moisture to distribute equally among all pieces that came out of the dryer. Otherwise, mold will appear, and your dried food will be useless. 2. Fruit conditioning. Place the dried, cooled fruit into glass jars or plastic containers for the conditioning process. 3. Seal your containers and wait for ten days. This is a crucial part of the process. The excess moisture from some pieces will be absorbed by the pieces that are dryer. 4. Shake the jar every day to separate the pieces. Do this to even out the moisture. If you see any condensation on the jar, put the fruit back into the dehydrator for further drying. 5. When the fruit is ready, you can package and store it. 1. Make sure you seal the dried food well. Dried fruit is especially attractive for insects, but it can also absorb moisture from the air, and that’s why it has to be sealed properly, right after it’s done. Wait for your dried food to cool off and package it in tightly sealed Ziploc bags, or glass jars. 2. Get the right packaging. You can use anything from Ziploc bags, metal containers, plastic containers, glass jars, pretty much anything that has a tight lid. You have to keep the moisture out of the package once it’s full. 3. Don’t use metal containers with sulfured dried fruit. If you have only metal containers, place the dried, sulfured fruit into plastic bags first. Sulfur reacts with metals, and the dried fruit can change color. 4. Pack the containers as tightly as you can, but don’t crush them. 5. Pack only the amount of food you will use in the recipe you plan on using. When you open a package, the contents are exposed to moisture and air, which will lower their quality. Once you open a package, use everything inside. 1. Store the foods in a dry, cool, dark place. The quality of dry food depends on the heat. If the temperature is higher, the food you stored has a shorter lifespan. Freeze it to maximize the storage time. 2. Use the food you opened within 12 hours to get the best quality. 3. Check your stored dried fruit from time to time to see if they are in fact dry. Even though the food you put in a package looks like it’s completely dry, it can spoil if it absorbs moisture. If your containers aren’t completely sealed, moisture can get in and spoil the contents. If you see any signs of moisture, change the packaging right away. If you see mold, you’ll have to throw it away. Here are the most popular techniques of food dehydration you can quickly master at home. The citrus bath is a technique that’s used to prepare fruit for the dehydration process. The acids from lemons prevent browning of the fruit while it dries. The entire process is simple; anyone can do it. First, you have to clean all the fruit and cut it into slices that are about the same size. Then, mix lemon juice with water with the ratio 4 to 1. You can also use pineapple and lime juice. Now, when you have prepared the bath, place the sliced fruit inside and wait for 5 minutes. The preparation is now finished. The next step is to set the temperature of your dehydrator to 140F and place the fruit inside. Keep in mind that fruit with lots of water, like bananas, tomatoes, lemons and others take more time to dry because they contain more water than other food. The estimated drying time is about 10 hours. You can also mix the fruit with vegetables in a blender and then pour the mixture over a plastic wrap. Put it in the dehydrator set to 110F, and you will get a soft fruit leather coating in under two hours. You can later use these ingredients to spice things up in the kitchen. Vegetables are the easiest to dehydrate, and there is only minimal preparation. Clean and slice the veggies into even slices, just like with the fruit. Vegetables like carrots and eggplants have to be steamed first, while potatoes, summer squash, and others need to be blanched. That means that you have to put them in boiling water for a short time before you put them in the dehydrator. Drying meat in the dehydrator is also possible, but you’ll have to spend a bit more time preparing it. Before putting it to dry, you have to cut the meat and make meat jerky. The good news is that meat dries much quicker than fruit and veggies. Once the meat is cut, get your favorite marinade and pour it over every piece separately rather than soaking the pieces in the mixture. When you covered all the pieces, leave them in a glass dish to soak the flavor for about 12 hours. Set the dehydrator to 150F and put the marinated meat jerky inside. Leave it there for 4 hours, and you’ll have the best dried meat jerky you ever tasted. Drying herbs is a category by itself. It’s super easy and super fast. Just clean the herbs and separate the leaves from the stems. Then, place them into the dehydrator, but make sure they don’t overlap. Wait 5 hours, and you’ll get excellent spices and dry herbs that are perfect for a seasoning.